“My mother believed education was the key to everything in the world,” Justice Sotomayor said. [Editor’s note: Tickets to see Justice Sotomayor at the SJSU Student Union ballroom are sold out. The event will be streamed live from the SJSU home page. SAN JOSE, CA – As Professor Maria Luisa Alaniz read Sonia Sotomayor’s autobiography, she recognized a strong connection between the associate U.S. Supreme Court justice and San Jose State. “Her story is the story of our students,” Alaniz said, so she put these observations in writing in a letter of invitation to Sotomayor. Her thoughts must have struck a chord. 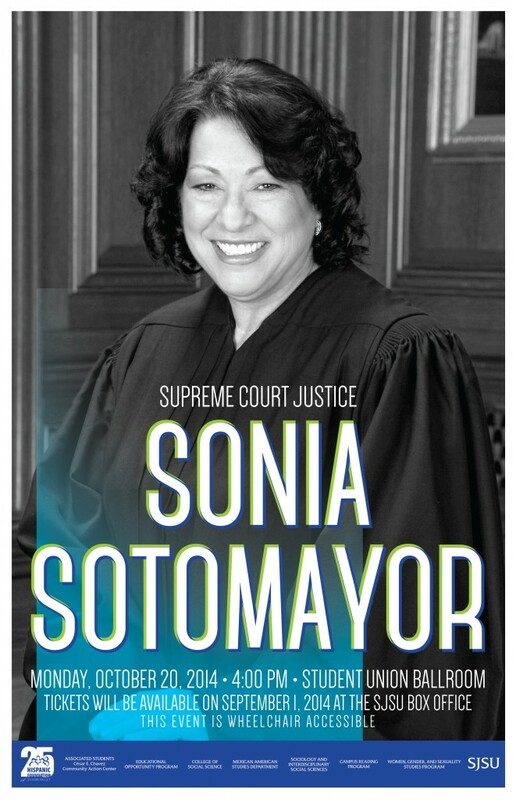 The Honorable Sonia Sotomayor will speak at 4 p.m. Oct. 20 in the SJSU Student Union. She will sit down for an on-stage conversation with UC Berkeley Professor of Law Melissa Murray. Murray teaches constitutional law and clerked for Sotomayor on the U.S. Court of Appeals for the 2nd Circuit. In nominating Judge Sotomayor to the highest court in the land, President Obama pointed out that her life story was the embodiment of the American dream,” a New York Times book review said. “She grew up poor in a Bronx housing project at a time when gangs were carving up the neighborhood, learned she had juvenile diabetes when she was 7 and lost her father a couple of years later. Professor Alaniz observed Sotomayor’s persistence reflects that of many SJSU students. In my 26 years of teaching, I have been amazed by the resiliency of our students, who work so hard to get through school,” she said. Once reluctant to share her personal story, Sotomayor is now eager to help young people following in her footsteps. For this reason, event organizers will reserve the first 20 rows of seats at the campus event for students. Sponsors include the Educational Opportunity Program, Hispanic Foundation of Silicon Valley, Cesar E. Chavez Community Action Center, College of Social Sciences, the Department of Mexican American Studies, the Department of Sociology and Interdisciplinary Social Studies, the Campus Reading Program, and the Women, Gender and Sexuality Studies Program.